Another really neat ride. 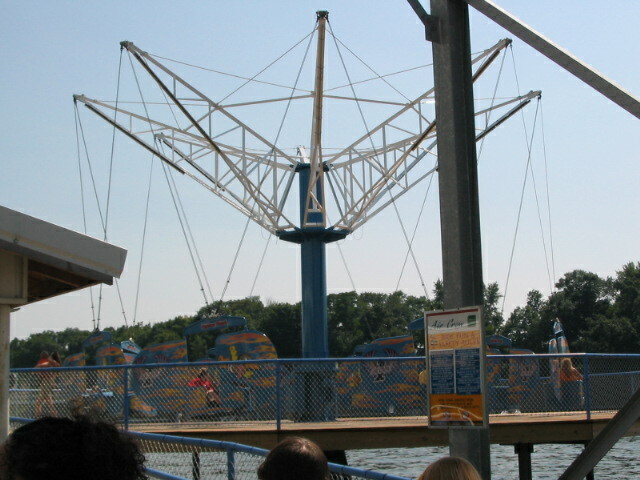 Like others have said the water really adds to the experiences (a very common theme of the rides of Indiana beach). But my cart got a lot of wild movement. At points it was aimed directly down at the water. It was also a windy day so this added to the feeling of flight. Great set of flying scooters. I love the location over the water and swinging over the water provides quite a thrill. Unfortunately the park doesnt permit snapping, but even so the ride had very good movement, especially since the wind helped give great movement. It also has a really long cycle. Excellent flat, possibly even better than the Falling Star, though I cant be certain of that. The location is absolutely perfet for a ride of this type and cable snapping is allowed despite what that evil sign claims, because I did it without being yelled at. I think it would benifit from running another 5-10 rpms faster but really a fantastic flat anyway. First let me start by saying the only scooters that are better are Knoebels, but they are both good for unique reasons. APPEARANCE-9 The arms that hold the ride appear very plain. The cars are fantstic and themed with the IB Crow. If it wasnt for inconsiderate customers peeling the decals the ride would look absolutely perfect. The fence and deck the ride is built on is also nice. RIDE QUALITY-9 Only Knoebels offers a longer ride cycle. The speed is good the wind really messes with the car and the no snapping rule seems to only be there so someone cant sue them. The op said nothing they just have a sign. CAPACITY-8 Although I had no line this appears to be an attraction that could have a decent wait. One ride op, single riders and a long cycle could equal a long wait. I have never had a busy day at IB so I have never seen their capacity tested. FUN-10 I had a great time. The view is awesome the ride is fun, and I could hear my family laughing all the way through. This is a must for scooter fans. RERIDE-10 A new must ride at the beach. It is now my fourth favorite ride there. For flats it is just behind their awesome Falling Star OVERALL-46 AVG-9.2 So I will rate it a 9. Not quite as good as the Falling Star but definately worth your time. OMG. What a ride. Im a high school student, and several of us got to go on some of the rides for a Junior Achievement luncheon (okay, thats the reason why I rode it, now let me tell you about it)...Im not a coaster fan, so I decided to try out this. It is an awesome thrill. You actually feel like youre a bird, flying up and down, around in circles. And the wind is a strong factor. I just felt like I was so free and totally in control. I was a little dizzy afterwards, but above all, this ride ROCKS!!! Nowehre close to the scooters at Knobells or King;s Island. No snapping allowed, but I dont think it would be possible anyway. The location is great, over the water, but a disapointment.